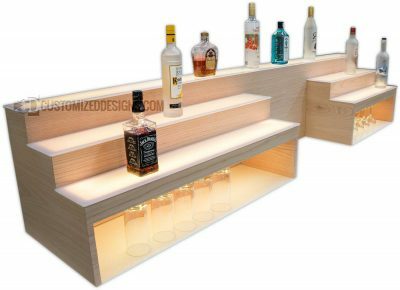 Customized Designs essentially invented the led lighted bar shelving market back when it was established in 2004. 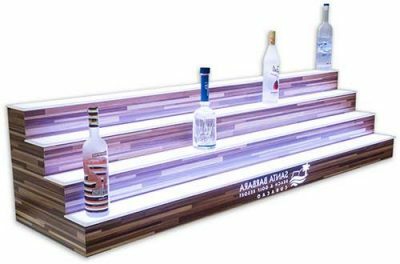 Today we are the largest manufacturer of led lighted liquor displays in the world mainly due to our constant innovation and dedication to customer satisfaction. 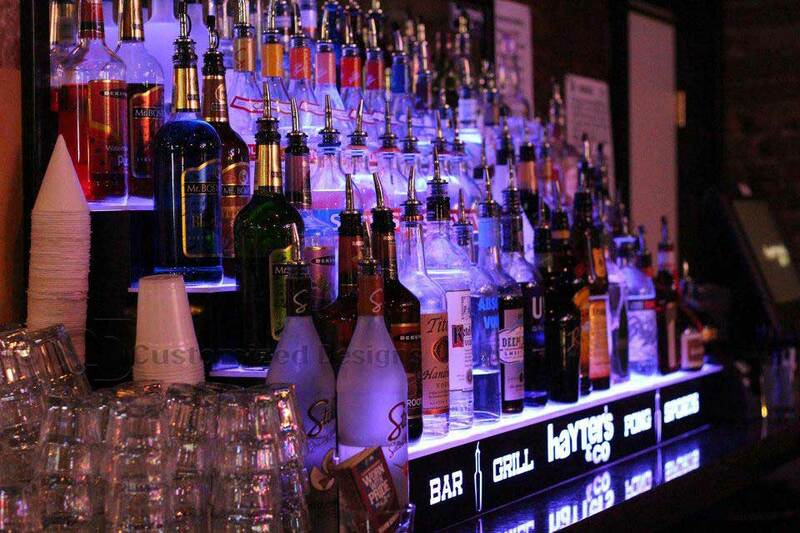 Each and every one of our liquor shelves is fully customizable and custom tailored to your needs. 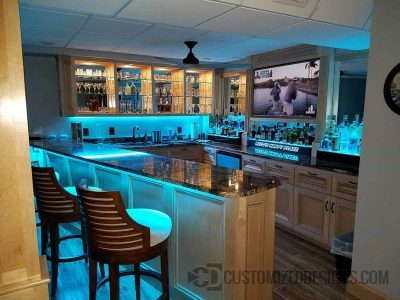 You can choose your exact length and color/finish so it works perfectly for your restaurant, club or even your home bar. 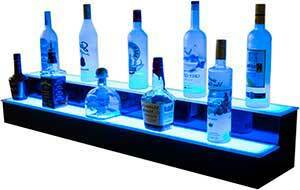 We offer the largest selection of color options and bar display styles you'll find anywhere. 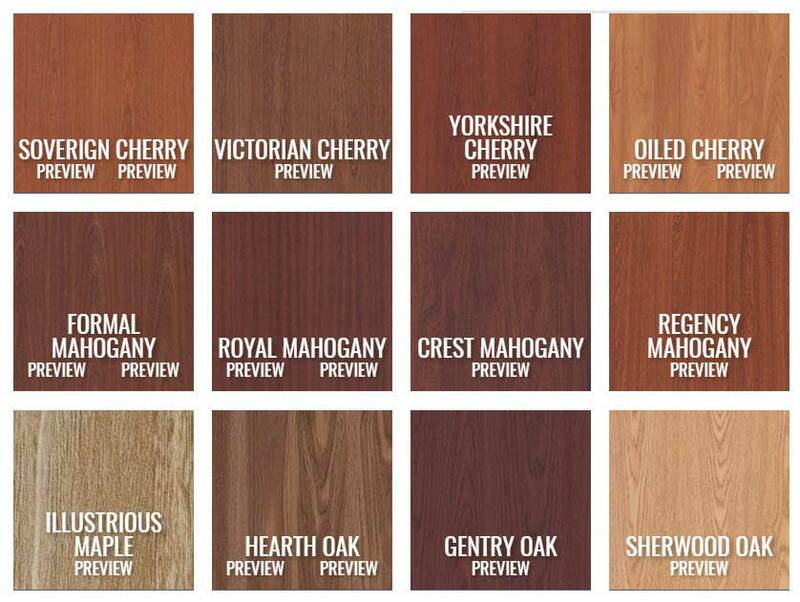 Check out our Colors Page to see all the available options. If you don't see a color you like, we'll find one. 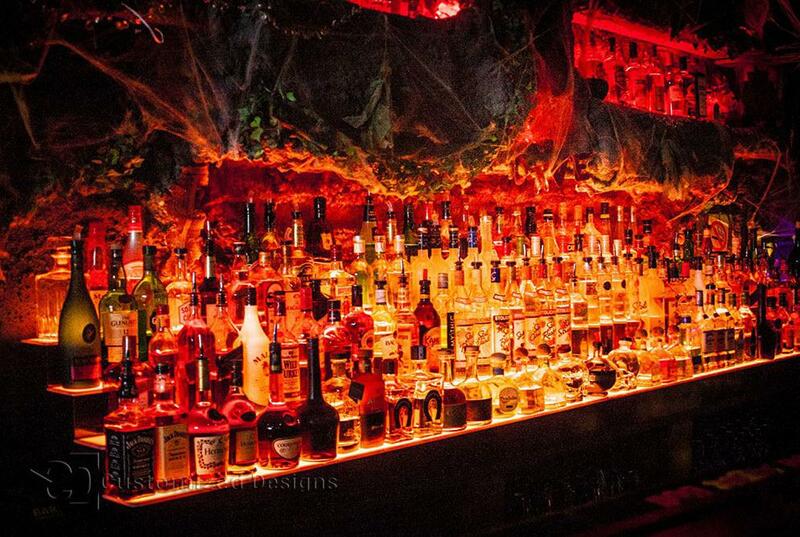 If you don't see a style of liquor display you want, we'll invent a new one. 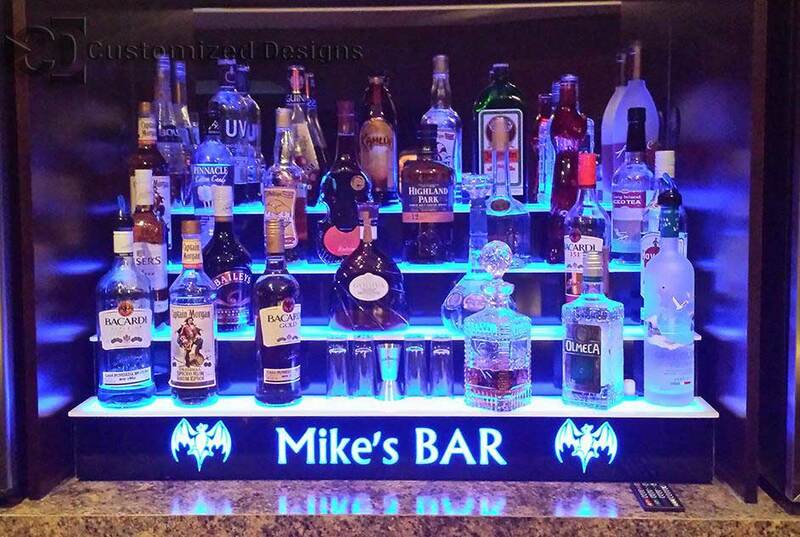 We named our company Customized Designs for a reason. We love making custom products and we love giving our clients the ability to create what they really what, not what everyone else has. 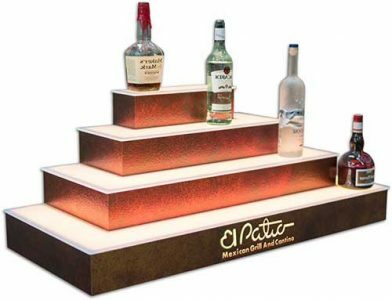 For over a decade, we've stayed ahead of our competition by continuing to improve our liquor display's designs and always offering the best LED lighting system available on the market. 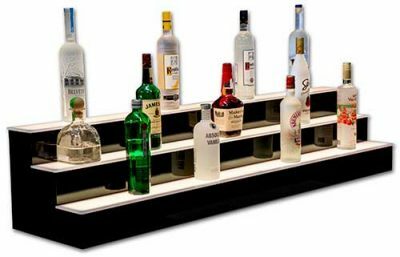 We now offer just about every variation of liquor shelves you can possibly imagine! 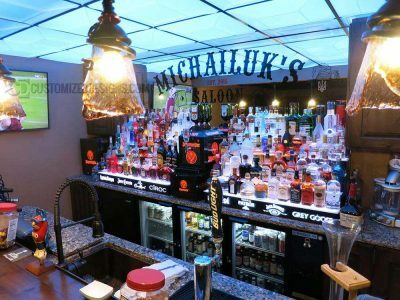 Whether you're opening up the hottest new bar in town, plotting against your wife to build a sweet man cave or just need some ideas for your new home bar, we have hundreds of pictures of our past projects throughout our website to get your imagination going! 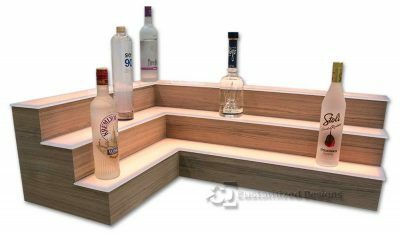 How many bottles will a display hold? 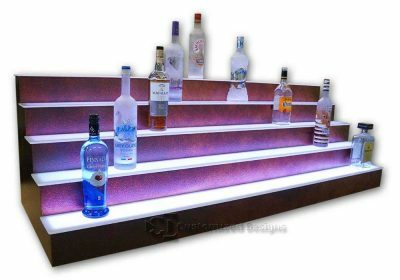 Can I choose the color of the led lighting? How much energy do your L.E.D.s use? 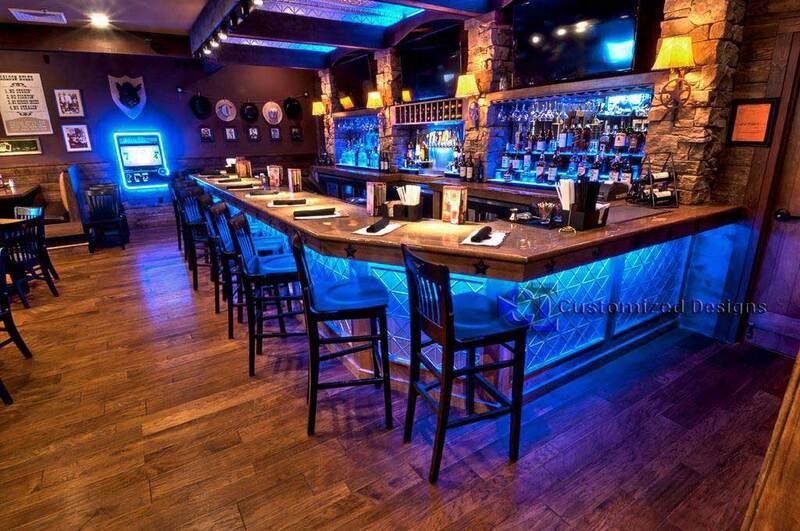 • We use a higher than average intensity LED lighting and it's wattage varies depending on the color setting. 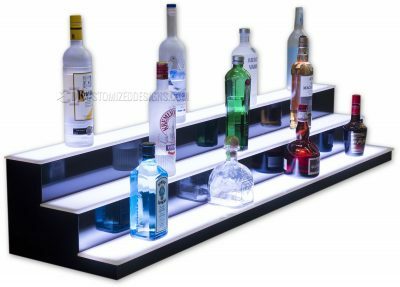 • White - 4w per linear foot • Green - .1.5w per linear foot • Blue - .1.3w per linear foot • Red - .9w per linear foot • A 3 tier 48" shelf, for example, would run on approximately 48 watts on white. Where does the power cord come out? Can I move it? • For standard displays, the power cord comes out the back right (when facing it) towards the bottom. • We can put the cord exit wherever you prefer upon request. Can these displays be used in an outdoor bar? • Yes and no. 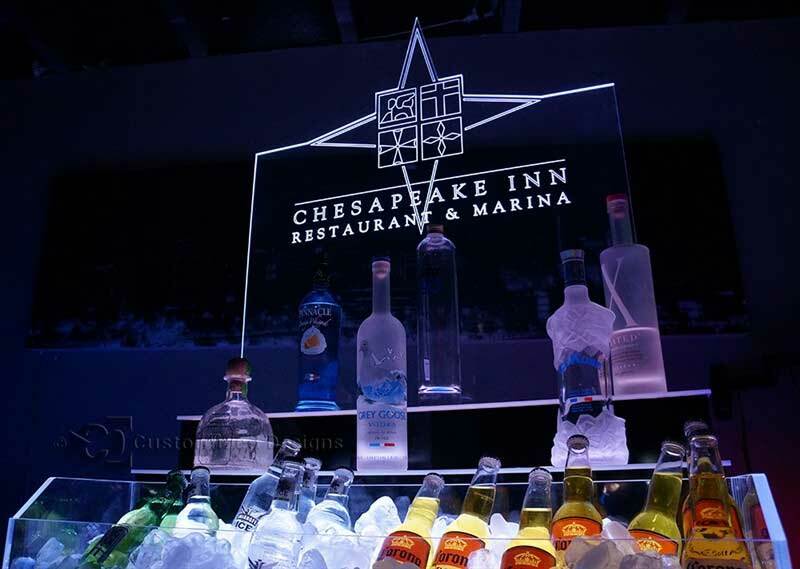 While our displays are sealed fairly well and use water resistant LED lighting, we don't recommend putting these displays where they would be directly exposed to the elements: Rain, sun, snow, salt water etc. 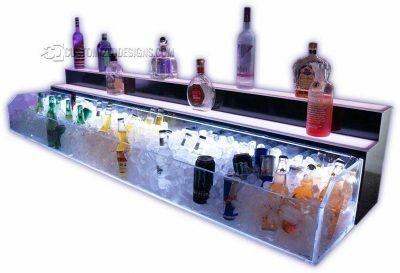 • Covered outdoor bars are usually fine and each display includes rubber feet to keep water/spills from pooling underneath it. 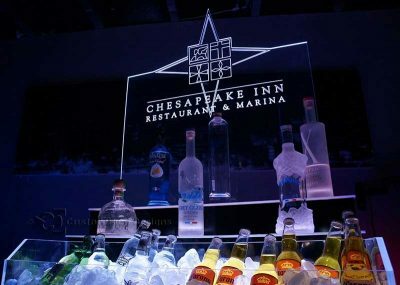 • Displays for oceanfront bars that will be exposed to extreme humidity and saltwater can be specially made to hold up to the elements. Contact us for details. Are the bottom or back of your displays finished? • Neither the back or the bottom of our displays are finished. 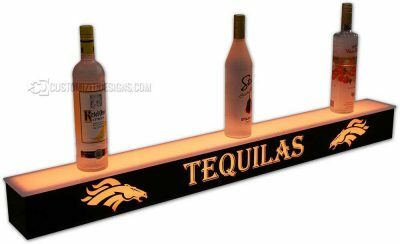 • If you are mounting a display above eye level, you can request to have us finish the bottom with the same color as the front/sides. 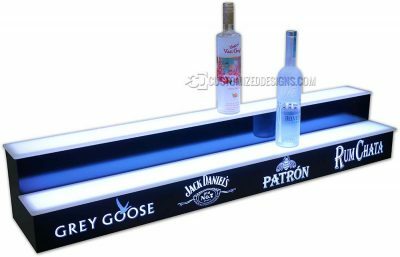 • If your display will be visible from all sides, you can request to have the back of your display finished. 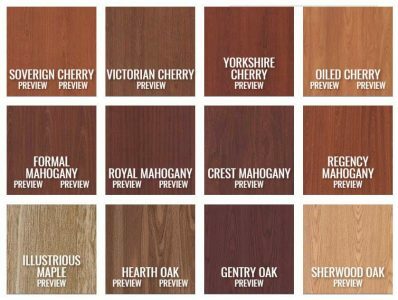 • Formaldehyde is a chemical bonding agent used in most MDF wood. Formaldehyde can cause allergic reactions in certain people and has been linked to some forms of cancer. • For this reason, we only use formaldehyde-free MDF both for the safety of our employees and our customers. • You will find large furniture manufacturers like IKEA also don't use materials with added formaldehyde. 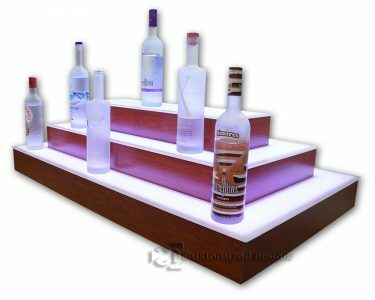 • While formaldehyde free materials are much more expensive than those without it, we feel the added cost is well worth it. Don't you? If you still have questions about our Bar Shelving, please don't hesitate to contact us! All of our liquor displays can have your logo, favorite sports team or favorite liquor brand added to the front! If you have already have a logo design, you can upload it after checkout when you select the "Add a logo" option. For best results we require that all designs be in high resolution. Acceptable formats are: .ai, .eps, .pdf .png and high resolution jpeg. Please note that if you submit a low resolution file, we may not be able to work with it. Don't have a logo? No problem! 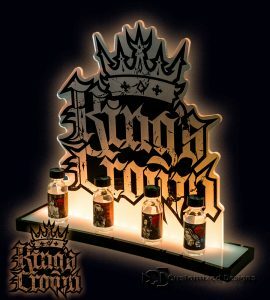 We can also create logos many different type fonts which can be downloaded from dafont.com or any other font website. If you choose to go this route, simply leave the upload logo form empty and email us both your logo phrase and which font you want it in. Be sure to include the font name and the website you found it on. 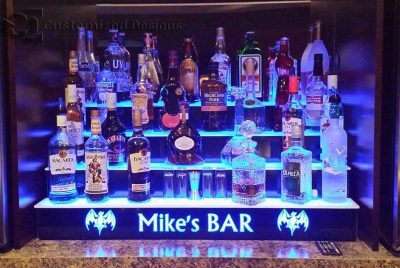 We have the capability to add full color logos to your liquor shelves. This unique ability allows you to use the true original colors of your logo and use much more complex logos than ever before. This logo style is ideal for corporate branding and highly complex logos with a lot of color detail. Currently color logos can only be achieved on displays with black finishes. We have the ability to implement a wide variety of logo types. 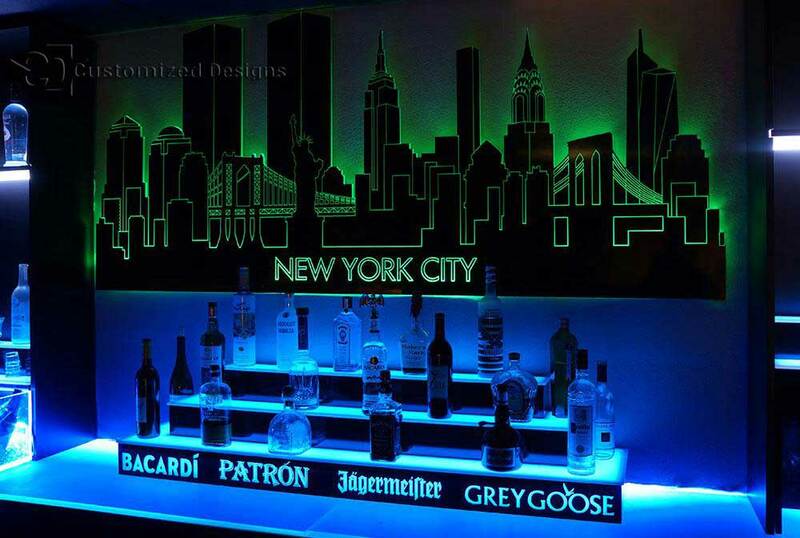 Edge lit panels, full print graphics, etc. 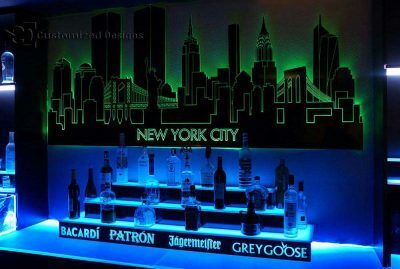 Be sure to contact us for more information on these types of custom logos.